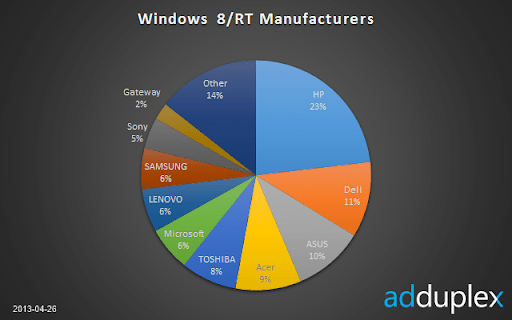 Not much is happening within Windows 8/RT device ecosystem and we weren’t planning to do a report this month, but since a lot of people asked – here is a quick one. Check out the March report for some deeper details. 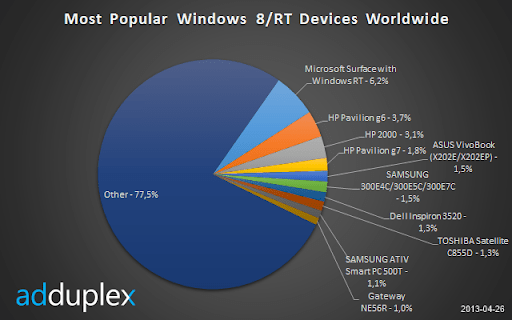 This report is based on data collected from 226 Windows Store apps running AdDuplex SDK. The raw data analyzed was collected over the day of April 26th, 2013 (UTC time). We’ve made every attempt to consolidate different reported model names under their canonical retail model names, but it’s possible that some of the rare model name variations were not accounted for. We’ve seen more than 9,000 different device models overall, but as far as top 10 goes not much has changed. The only notable new entry is Samsung’s ATIV Smart PC 500T, but it was at #11 last month so still not too surprising. Still it’s nice to see that there are 3 touch screen devices in the top 10 now. For those wondering about Surface PRO, it’s at #23. Up by modest 2 slots from a month ago. As for manufacturers, there are even fewer changes. Actually zero changes in the rankings and only a few minor changes in the percentage numbers. Seeing that there aren’t many news to report for this month’s data we decided to stop at these high level stats. We’ll see if there’s anything more interesting to report next month and drill deeper accordingly.